TKP's İstanbul metropolitan mayoral candidate Zehra Güner Karaoğlu was interviewed by Liberation news on the upcoming local elections on March 31st. The Communist Party of Turkey (TKP) announced that the party will be the one and only political party that truly represents the working people of Turkey in the elections. TKP has launched its electoral campaign in all 81 provinces of Turkey, 85 districts and 2 towns with its mayoral candidates and municipal councils. Participating in the elections with the motto "We are not in the same boat", TKP nominated three women mayoral candidates for the biggest cities of Turkey, İstanbul, Ankara, and İzmir. The Communist Party of Turkey (TKP) is engaging in the electoral space at the municipal level with the slogans “Against the reign of capital, the people have TKP” and “We are not in the same boat” despite problems of repression, freedom of expression the progressive and revolutionary forces are facing in Turkey. Can you talk about the main reasons behind your participation in the municipal elections? The TKP considers elections as part of the class struggle. There are many capitalist parties participating in the elections. TKP wants to fight for the rights and interests of workers, laborers and to show that the workers in our country are not condemned to the rule of the bosses. We want to intensify, organize and expand the struggle we are waging against the capitalist class and to increase the votes of the party of the working class. We are the only party in the elections that calls for this order to be overthrown. In many large municipalities in the United States, the erosion of workers living standards and access to social housing, education and healthcare are major challenges. Is this a similar situation in Istanbul, and what are some of the TKP’s proposals to address this? Yes, we are experiencing similar attacks against the working class. We think that communist municipal work is based on people’s rights. Transportation is a right, housing is a right, access to water use is a right, education, health care are rights and these rights cannot be bought and sold with money. Our main goals will be to provide the working people with healthy and robust housing, access to education, to ensure reliable mass public transport, to provide paid time off for rest and vacations. The protection and expansion of public city parks against the assault by the gentrifiers is only something that can be accomplished by the struggle led by communists in local governments. Another major issue for workers here is the abuse of municipal processes and structures by capitalists seeking preferential contracts and tax relief, how does the TKP approach the issue of ethical administration in municipal government? TKP is waging a struggle against the administration of municipalities like a for-profit company with mayors as CEOs. For us, the municipality is not a company, and municipal workers are not assets to be exploited. Another issue is transparency. TKP aims to manage the municipalities with the organized participation of the people. This is the first stage of a transparent management model. Who are the main opponents of the Party in the municipal races? How does the Party distinguish its intervention from other forces that, at least rhetorically, claim to support social rights for the working class? As you also stated in the first question, we state that we are not in the same boat with the capitalist class. Our job is easy because the parties that have entered the elections have been governing the municipalities for years and have not been able to solve the problems faced by the working people living in the cities. While the urban problems are growing exponentially, the workers face the cost of living and unemployment. In addition, these parties have formed various unholy alliances as part of their electoral strategy, and many are aware of how unprincipled these alliances are. The fact that TKP does not compromise its principled, programmatic line makes it very easy to distinguish us from the others. In addition, TKP is the only party that represents the progressive values and experience of the country. TKP is the only party on the left in the elections. Our job in these elections is easier than other elections. What does success look like for the TKP? Is it solely “winning” or does the Party anticipate the campaign will create a stronger community base for further workers struggles regardless of the outcome at the ballot box? We can say that TKP already won before the elections even take place. During our campaign, we have made so many friends and comrades. However, we would also like to increase our vote at the ballot box. We want to grow the struggle for socialism in our country. We want to strengthen the barricade the party is building against this capitalist system. Of course, the path to achieving this is through increasing the number of those who struggle for the historical interests of the working class. 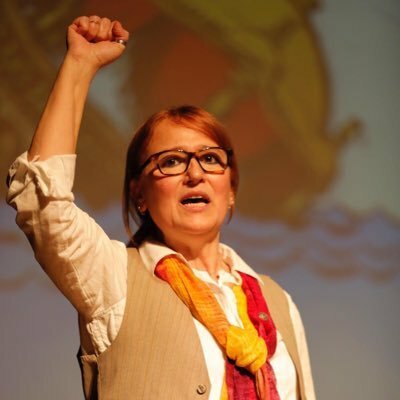 TKP's mayoral candidate for Güngören, İstanbul: "I am a worker, communist, and TKP member"